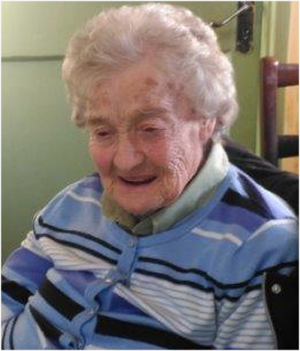 Bridie O’ Brien (née Russell) Ballyknocken, Glenealy, Co. Wicklow, 9th February 2019, peacefully in her 95th year surrounded by her loving family, at St. Clomcille’s Hospital, Loughlinstown. Beloved wife of Sean, loving mother of John, Michael and Damien, sadly missed by her loving husband, sons, daughter-in-law Niamh, grandchildren Ayrton and Laura, extended family, relatives and friends. Bridie will be reposing on Tuesday evening from 6.00 pm to 8.00 pm at McCrea’sFuneral Home, Dublin Road, Wicklow Town ( A67 E003 ) with removal Wednesday morning at 10.15 am to St. Joseph’s Church, Glenealy arriving for 11.00 am Funeral Mass followed by interment in Glenealy Cemetery. Enquiries to McCrea’s Funeral Home, Wicklow Town 0404 – 69000.